Unlikely: Plenty of others, I’m sure! The rundown: Last year, this category threw everyone for a loop by preserving just two of the nominees from the Golden Globe and DGA lists. That’s unlikely to happen again this year, but let’s look at the contenders analytically. Everyone agrees that it’s a battle between Steve McQueen (12 Years a Slave) and Alfonso Cuaron (Gravity). Neither of them is at risk for being snubbed, especially since both likely garnered a number of votes in recent years for “Shame” and “Children of Men,” respectively, and this would mark their first and very overdue nominations. David O. Russell (American Hustle) is a strong contender because he managed to get nominated in this category without a Globe or DGA bid, and he was nominated for all three back in 2010 for “The Fighter.” Paul Greengrass (Captain Phillips), this year’s other Globe- and DGA-nominated director, netted an Oscar nomination only in 2006 for “United 93,” and he should be safe. After that, it’s anyone’s guess. 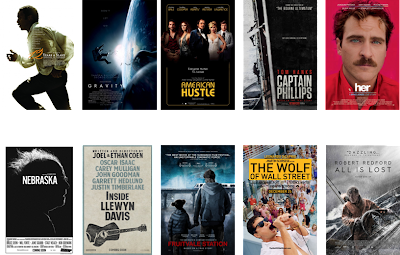 Alexander Payne (Nebraska) was nominated for the fifth Globe spot, while Martin Scorsese (The Wolf of Wall Street) clinched the DGA nod. Scorsese has been nominated seven times in this race, but two-time nominee Payne’s film is the more evenly-reviewed one this year. Joel and Ethan Coen (Inside Llewyn Davis) have earned three Oscar nominations in the past in this category, one of which was done without a Globe or DGA precursor, as would be the case this year. That will film need a serious Oscar boost since guilds haven’t been too enthusiastic about it at all. Two younger directors could upset for their first and second films, respectively: Ryan Coogler (Fruitvale Station) and J.C. Chandor (All is Lost). I’d be ecstatic about the first, but I don’t see it happening at this point. My pick for the fifth slot is a director who made it in without a Best Picture nod in 1999 for “Being John Malkovich” and picked up a subsequent Globe nod in 2002 for “Adaptation.” Spike Jonze (Her) has seen his film do very well this awards season, and in a world where there is no longer a “lone director nominee” since Best Picture includes more than five nominees, he seems like this year’s unexpected choice. One possible crazy scenario: Oscar voters experience a true case of misdirected enthusiasm and nominate Jean-Marc Vallée (Dallas Buyers Club). Forecasted winner: Even if Cuaron scores most of the precursors, I think McQueen takes this prize.